June | 2014 | Dude, Where's My Pancreas? My last chemotherapy treatment was June 16. This was my first official week of being finished with treatments. I woke up Monday morning and decided to try a simple fartlek style speed workout. I have maintained a base level of running over the past few months but I certainly do not feel fit or in racing shape. A common theme for me throughout my treatment was that I had trouble practicing my mantra of “moderation in all things” on the days I felt halfway decent. This continues to be an issue for me. Instead of going out for a couple of miles of speed work, I felt so good and so happy that I ran ten miles at a faster pace than I have become accustomed to running. I had to ditch my watch long ago. I knew I was getting slower and stressing myself out by looking at my pace as it fell off over a cliff was mentally destructive. I have no idea what pace I was running on Monday, but I know it was faster than what I have been doing lately. I let perceived exertion be my guide. It felt great to really use my leg muscles and work my lungs. When I finished I felt so happy. The physical and emotional boost of getting in a good workout was tremendous. Still, I probably ran too hard for too long. I spent the next couple of days paying for my over exuberance. On Tuesday, I did a run/walk. I wanted some exercise but I took it easy because I had to. I really had nothing left in the tank after Monday’s run. That evening, my family made it’s first post cancer appearance at a Jack Quinn’s Running Club run. Last summer, we were regulars at JQRC, but after I found out I had to have surgery, we stopped going. I had hoped to go some over the winter and spring, but found that I had absolutely no energy in the evenings during my treatments. It was great to be back this week and it just kind of worked out that JQRC was having a field trip to Boulder Running Company. We ran the route and enjoyed some food and family friendly games afterwards. It was a treat to get to see so many friendly and familiar faces all in one place! All of this activity caused me to crash by Wednesday. 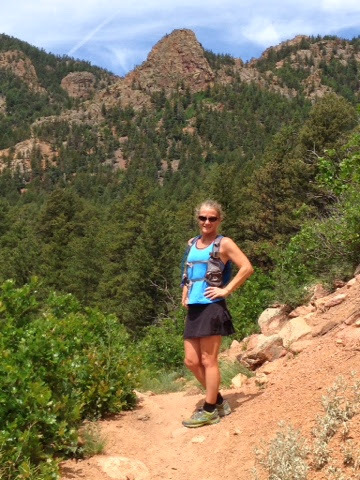 I met Tracey for a run in the Garden of the Gods and I am pretty sure that she thought she was going to have to call 911 while we were out there. To say I huffed and puffed my way through the Garden is an understatement. 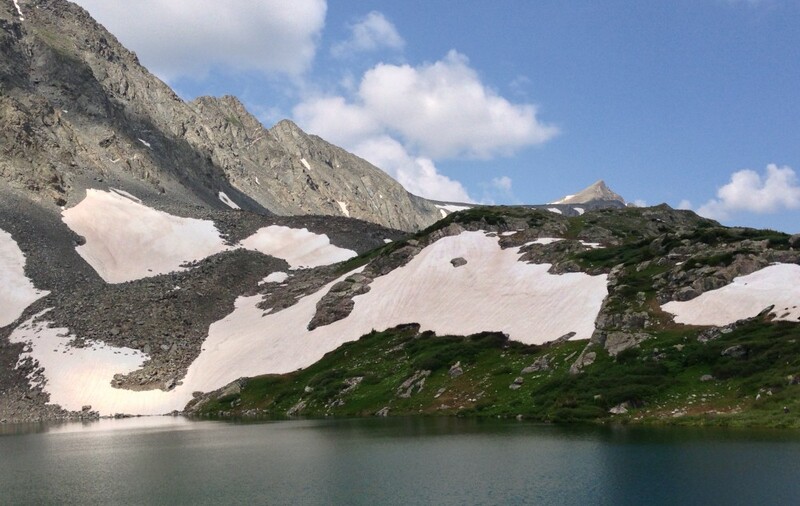 Even when I slowed to a hike, I was breathing hard and felt dizzy. A couple of times I had to come to a complete stop to return my breathing to normal. The company was great and the scenery as spectacular as always, but frankly I felt extremely frustrated with myself. I felt embarrassed that I was in such sorry condition and wondered aloud if I will ever be back to normal. 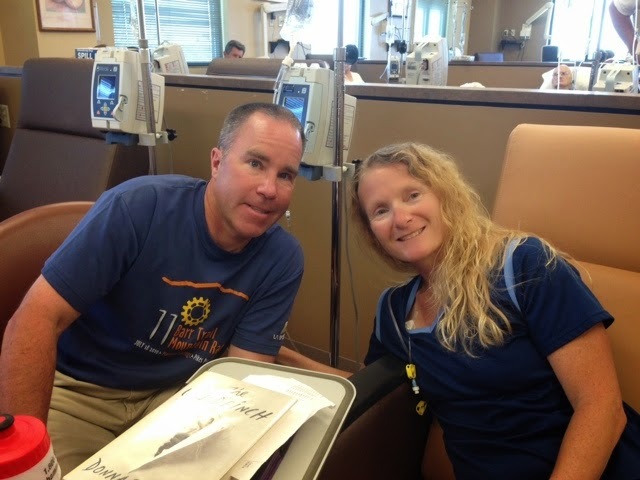 Final chemotherapy in the books! June 16, 2014. That is the day I finished my chemotherapy treatments. I remember the first time I saw my paperwork the official finish date for my treatment. Knowing there was a concrete end in sight brought me such joy and hope. Since September, my life has seemed to revolve around tests, surgeries, blood draws and chemotherapy appointments. The road seemed endless when I started. As of Monday, I reached the proverbial finish line. Yes, there will still be blood tests, CT scans, and doctor appointments to make sure I remain cancer free, but my life will now be treatment free. I want to thank my medical team. I had great care throughout this whole experience. My primary care doctor, Dr. Henley, is the reason my tumor was caught early. If he had not been thorough, my outcome would likely not have been as positive. I was also lucky enough to have an extremely skilled surgeon, Dr. Frerichs. I was filleted like a fish, and yet had no complications and as smooth a recovery as I could have ever imagined. I was scared to death going into surgery, but I was in very capable hands, and my scar looks awesome! I am deeply indebted to my oncologist, Dr. Markus. I appreciate that he came to our first appointment armed with studies and statistics. I am grateful for the fact that he obviously had spent time researching what to do with my unusual case. I appreciate his thoroughness, his professionalism and his compassion. Thank you, Dr. Markus! Finally, thank you to the nursing staff at Rocky Mountain Cancer Center. The nurses there are all great, but I especially want to give a shout out to Chris and Nora. They always gave me just the right amount of caring, compassion and humor and I will always remember them with deep affection. I had some side effects this week and Thursday was a challenging day, but I kept telling myself it would only get better from here. 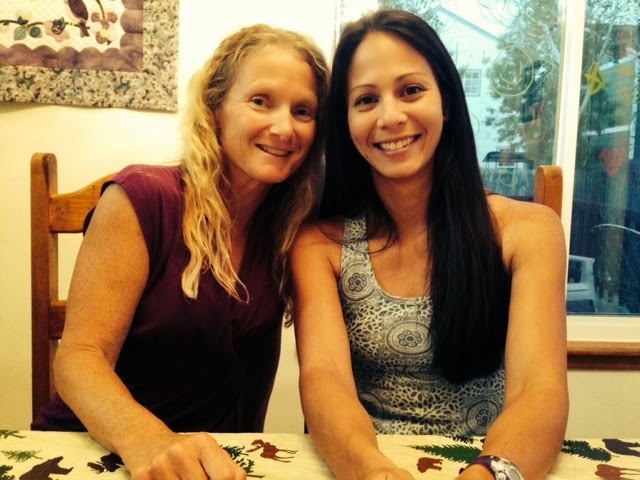 On Friday I did feel significantly better, which was great because I got a visit from a dear friend (and fellow runner) who moved away in December. The best medicine in the world is spending time with people you love. I miss my friend dearly and look forward to the time that her family can move back to Colorado. I got some running in every day this week. 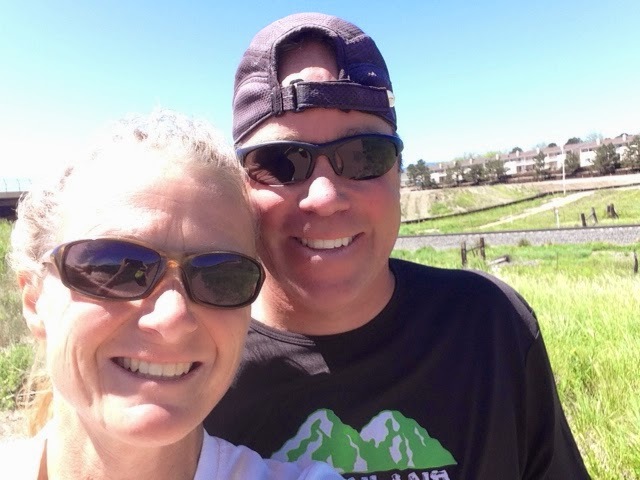 My longest run this week was with my friend Debby. We enjoyed the 13 mile loop of the Falcon Trail on Saturday. It feels good to be getting back out on the rolling single track trails again. 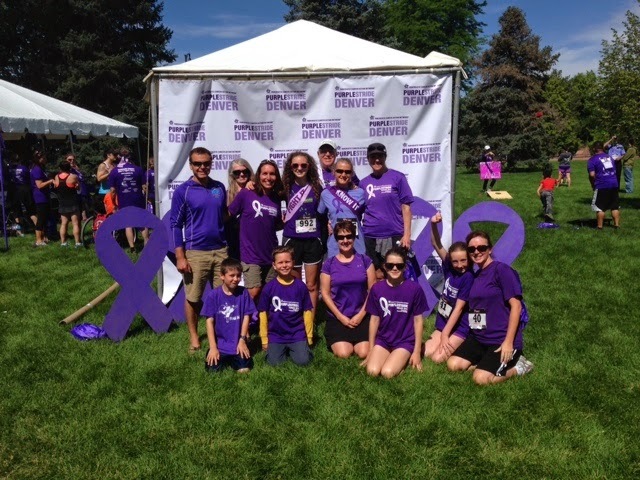 On Sunday, several friends and I participated in the Pancreatic Cancer Action Network Purple Strike 5k fundraiser in Washington park in Denver. I am grateful to all of my friends who joined me or donated money to my team. While I looked around at the other entrants, I was struck by how many people were participating in the 5k memory of a lost loved one. 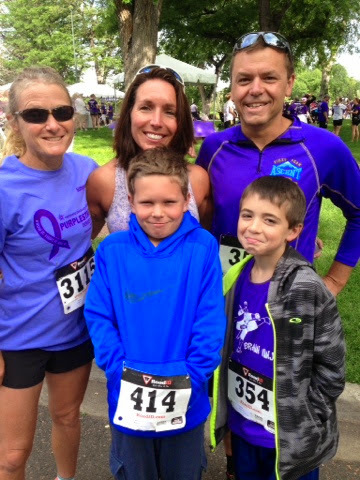 Pancreatic cancer has taken far too many lives. I hope that with more funding for research, progress can be made to improve survival statistics for this deadly disease. Today was a day that I did not care about running or times. I just wanted to celebrate being finished with chemo while enjoy a beautiful morning with my teenaged daughter and my wonderfully supportive friends. I had a weekend full of fun and time spent with people I love. I am a really lucky woman. I hope my readers have enjoyed following my treatment. I hope you all will continue to follow my story as I enter the next phase of recovering and return to running. Last Monday I had treatment number 17. Of course, we had to run first. We have not missed a single pre chemo run. My husband has been with me every single Monday for my treatments. 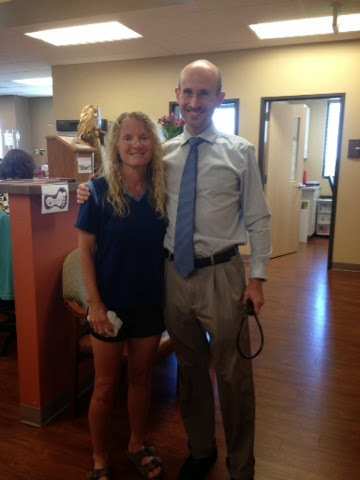 It was a priority for him to be with my for each treatment, and luckily he was able to make it work. He is a pretty awesome guy. It was my kids’ first full week of summer vacation. In theory this should have been a relaxing week of sleeping in, but there really has not been a whole lot of time for goofing off yet. Peyton started camp at Colorado College Monday morning and it seemed like every afternoon brought appointments and other obligations. Nevertheless, I found time for a daily run or run/walk. On Tuesday, I ran with Tracey and Arlo the wonder dog. On Wednesday, I went for a walk with Phil and his brother. 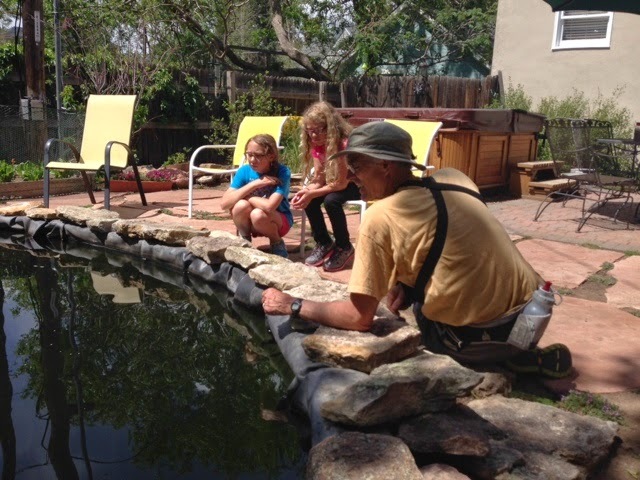 After our walk, Peyton, her friend and I enjoyed looking at and learning about Phil’s fish pond. I find the pond and the fish both beautiful and fascinating. I think the girls did also. 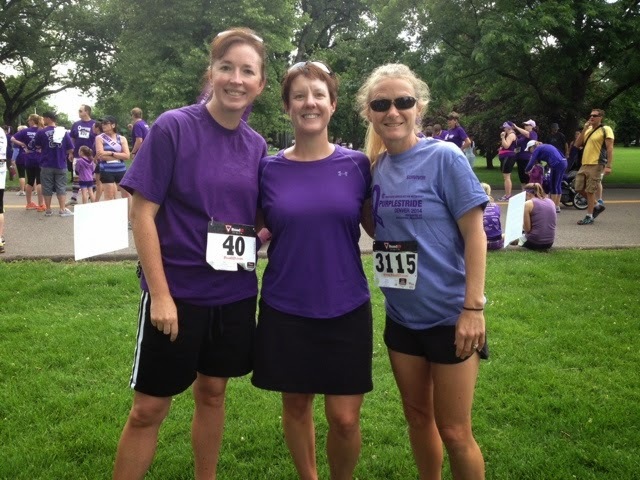 On Thursday, I ran with Debby and Steve. We had an unseasonably cool morning that day. Since I have become very heat intolerant from the chemo, the cooler weather was a welcomed relief. The respite was brief and we were back to warmth and sunshine over the next couple of days. 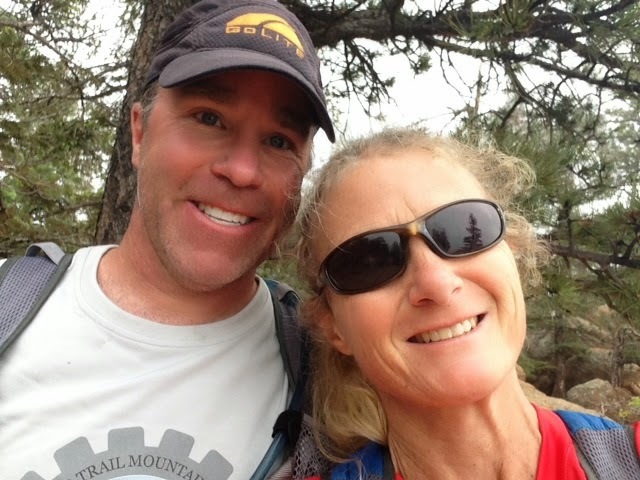 Friday and Saturday I ran on the Santa Fe trail, once solo and once with my husband. Today, for Father’s Day, Steve and I ran the Falcon Trail at the US Air Force Academy. This is a favorite trial of ours. It rolls all of the way through but is not super technical and is very runner friendly. It was beautiful and sunny today but fairly cool and breezy, which made for perfect running conditions. 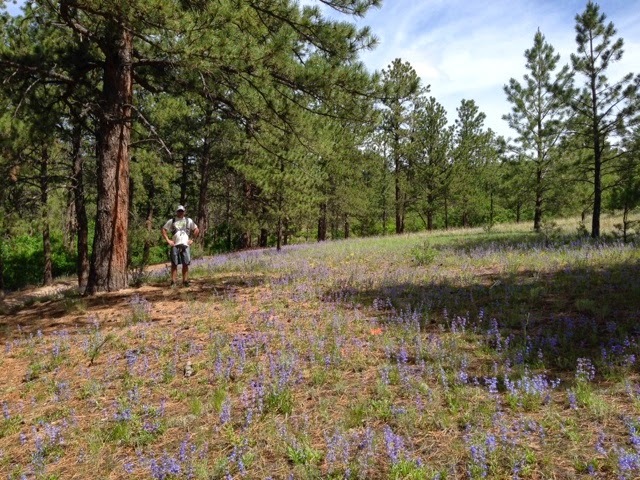 The wetter spring we have enjoyed has brought beautiful wildflowers to the trails. I was pleasantly surprised that I was able to run almost the entire trail today. I never know how I will feel until I get out there. I have my final treatment tomorrow. Two things have been running prominently through my mind this week. The first is how much I miss my family. I left home a year early for college and I have lived far from my family most of my adult life. When I moved to Colorado 15 years ago, it was truly love at first sight. The mountains called to me. Every time I woke up and looked at Pikes Peak, I felt like the luckiest person in the world. I have never regretted coming to Colorado. I still love my adopted home state deeply and I doubt that we will ever live elsewhere. But right now I miss my family so much that at times my heart aches. Most years, we take a trip back east over the summer. Last year, we planned our trip around the Vermont 100. This year, we planned our trip just because I need to see my family. I no longer take time for granted. We are all aging, and I have no idea how long we will all have one another. Going to NY just feels like something I need to do and I don’t ever want to look back with regret. My family is far too important to me. I have also been thinking about second acts in life. 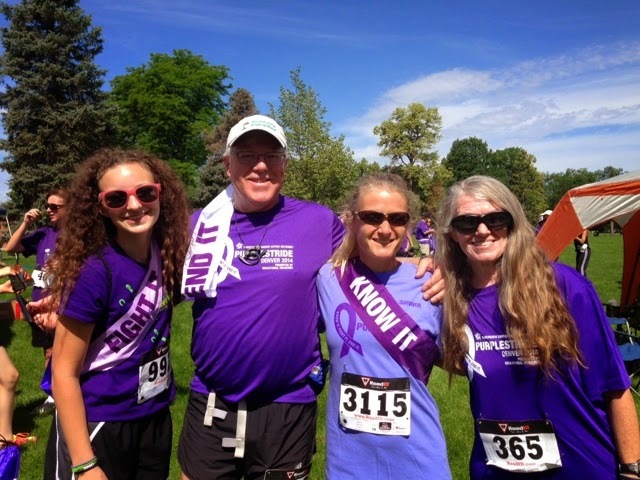 There are not a lot of people diagnosed with pancreatic cancer at an early stage. Not many of us are eligible for surgery. Those diagnosed after it has spread generally have an extremely poor prognosis. I was one of the fortunate few who could have surgery. When I was first told that I had to have surgery to take out half of my pancreas and my spleen, I did not feel particularly lucky. But now that I am wrapping things up, I know how fortunate I really am. As I look toward my last chemotherapy treatment, I am so grateful that I was given a chance for a healthy and happy future. I am well aware that many people with my particular cancer diagnosis are not so fortunate. Cancer patients often think in terms of life before and after diagnosis, because that diagnosis radically changes our lives. I loved my life “before”, but now I have a whole new appreciation for life “after”. I get to have an after, whereas I am so painfully aware that many people do not. I want to make every day of the “after” count. I am filled with a conflicting jumble of emotions: excitement, joy, anticipation and even fear. What will this second act bring? The possibilities are endless and I am looking forward to figuring out exactly how I will make the most of the time I have been given. As for this summer, I had planned to be running the Bighorn 100. That was not to be. I am not sad that I cannot be there. I know runners get disappointed when they get injured and have to miss a planned race. Right now, I just appreciate the fact that I will be here to plan future races. Instead of running 100 miles this summer, I will enjoy time with the kids, my husband, and my extended family. I will try to get back into racing shape as I regain strength and energy. For now, I look forward to finishing chemotherapy tomorrow. time to rest and recover this week. Tuesday marked the end of the school year for both kids. Any parent or teacher knows that this is a particularly busy time of year, filled with final exams and then celebrations. My oldest daughter is now a Junior in high school. 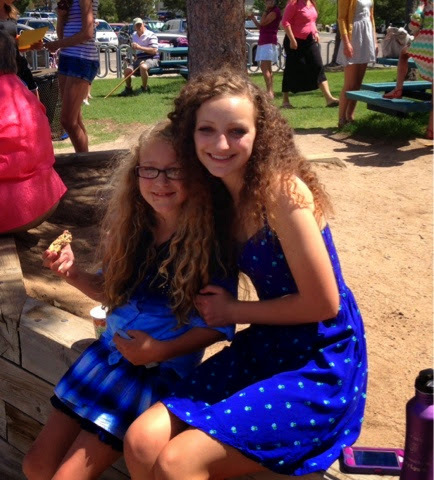 My younger daughter is finished fifth grade and now moves on to middle school. While I feel joy for my girls when they are about to embark upon an exciting transition, I cannot feel a little bit of sadness right now. After having had a child in elementary school for 11 years, that era of our lives is over. My illness turned my daughters’ lives upside down this year. They were both affected in different ways, I think my younger daughter was more impacted by my surgery, hospital stay and recovery. I was definitely not the mother she was used to seeing for quite a while. My older daughter, I believe, struggled more with the long term possibilities. Would her mother ever be the same? Would she lose me? When one family member becomes ill, the whole family is left to struggle with the fallout. Nevertheless, my daughters went on to have good years at school and they came out of everything with their spirit still intact. I give a lot of the credit to some special teachers in my daughters’ lives. I have to acknowledge Peyton’s fifth grade team at Explorer. I appreciate the fact that they went the extra mile to keep both normalcy and humor in Peyton’s life. Also, they made sure she never missed out on anything that was really important to her. Who knew that dissecting a squid would turn out to be possibly her favorite activity of the year? 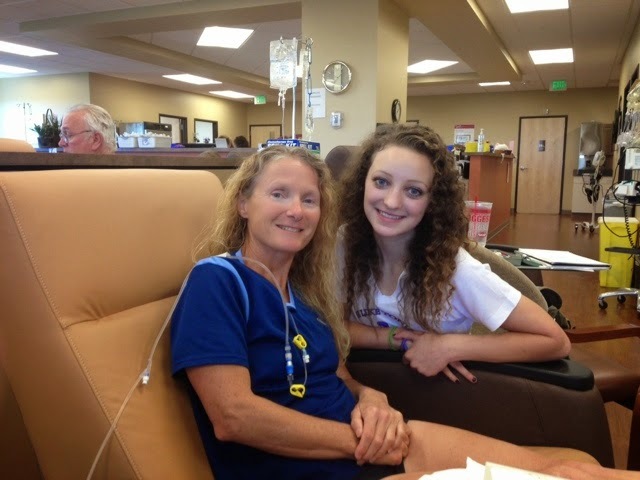 Also, there is a special teacher who retired the previous year who made time in her busy schedule to have lunch regularly with Peyton and to mentor her interest in the stock market. She did not have to continue to spend time with my daughter, but she did, and for that I will always be thankful. At Rampart, Riley really grappled with some of the superficiality that comes with being a teenager. She found herself thinking about things that few other kids just could comprehend. On the days when Riley just needed an adult to talk to, Mel always made time for her. Words will never be able to convey how much this woman did for my daughter and for our family. 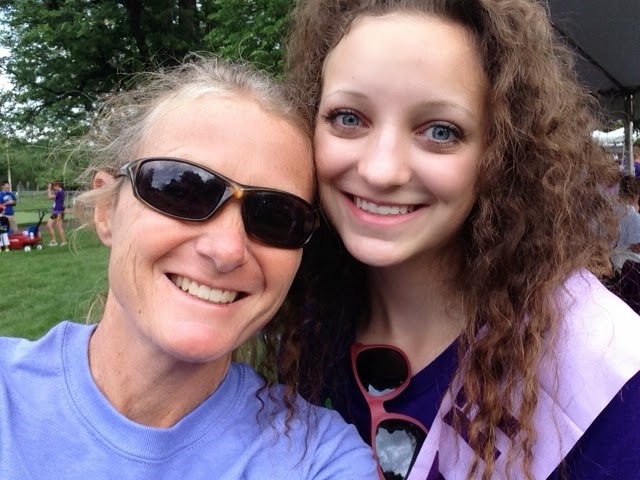 I could live a thousand lifetimes and I do not think I could ever repay her for being a mentor and source of support to my daughter throughout this school year. Since I got my cancer diagnosis, I have spent a great deal of time assessing my life. Have I done enough? Do I matter? Has my life been purposeful? If I did not have another day or month or year, would I be satisfied with the person I have become? I know my values have changed over the course of my life. When I was young, I thought money and a high powered career were the most important things. When I eventually got pregnant and gave birth at the age of 28, those values underwent a radical transformation. My priority became my family. I could not imagine anything more important than shaping the little people with which I was now entrusted. I was no longer living for myself but for others who were dependent upon me. When I was younger, I wanted to be an “Important” person. As I got older, I realized what was important really was my relationship to my husband, my children, my parents and my close friends. I have friends who struggle with depression. At one point in my life, I personally struggled with depression. Frankly, it haunted me until I finally made a conscious decision that I would no longer allow myself to be depressed. This is an over simplification, of course.It was hard work and took a great deal of effort to change my thought patterns. The point is, that I took steps to find meaning in my life and to be grateful for what I had. When I was sitting in chemotherapy the other day, I was scrolling through Facebook reading comments from friends about how horrible their lives were. I looked around me at people on oxygen and people who were too sick to walk. I saw husbands holding their wives hands as they received treatment. I saw people with upset stomachs and others sleeping awkwardly in their chairs. While I know my fellow patients must be struggling with their own demons, it struck me that in the face of tremendous adversity, all of these people had made a conscious decision to fight for their lives, no matter the personal cost. It’s funny how a potentially terminal illness makes you feel thankful for whatever life you have. You realize you would do anything in your power to get one more moment with the people you care about. Find meaning and purpose in your life, whatever that may feel like to you. It may come from your job or your family. It may come from being a volunteer for an organization you care deeply about. It may come from pursuing a passion or a hobby. If you do not think you have something meaningful in your life, take steps to change that right now. We all need to feel useful and purposeful. It gives us a reason to get up and face every day. Treatment 17 is today. Sixteen down and two more to go. My week off from chemo should theoretically be full of fun and games. This week turned out to be stressful. We had a car die and we needed to replace it quickly. My insurance company decided to deny another expensive claim. So instead of focusing on enjoying a week off, stresses over finances took a front seat in my mind. Nevertheless, I was able to get out and enjoy the weather this week. 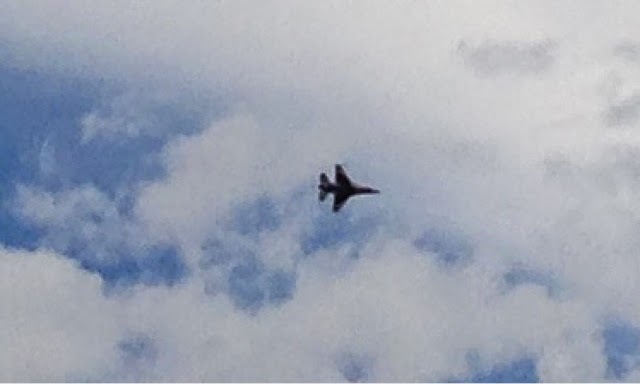 On Monday, during my run, I was fortunate enough to be on the AIr Force Academy grounds while the thunderbirds were practicing. On Tuesday, I thought I would attempt my once per month longer than ten mile run. I managed to finish 16 miles, but there was definitely some walking involved. On Wednesday, I met my friend Phil for a walk. Phil has been injured as of late and is required to take a few weeks off from running. Phil took me on a tour of his neighborhood. We saw some great horned owls, which was a real treat. 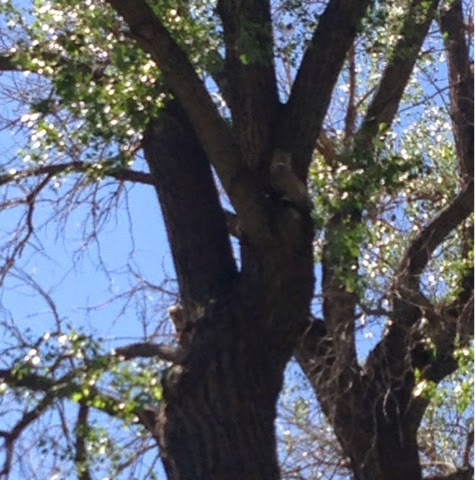 The lighting of this picture is not great, but if you look closely, you can see an adult and an owlet. 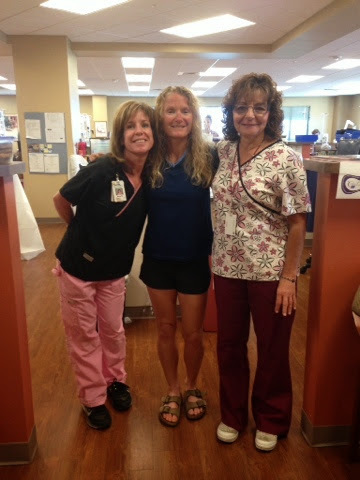 During the month after my surgery, when I could not run, I had several runner friends come and walk with me. I felt so fortunate that people would take the time to come and walk my thirty minute mile pace. Runners can be quite obsessive about their training schedules. We often don’t want to slow down and just walk. I love to run like no other, but I have found that I really see so much more when I go for a walk. More importantly, it made me happy to keep an injured friend company. That was infinitely more important than getting in a training run. On Thursday, I ran with my husband before he went in to work. On Friday, I ran by myself and actually felt ok. That does not happen very often these days. When I feel “ok”, it is a pleasant surprise. While I was running, I was thinking about how nearly every run since September has been hard. Some days, it is just no fun at all. I want to quit. I want to throw in the towel. But, I know I will just keep plugging along, doing what I can depending on the day. Some days will be really hard and others less so. People may think I am crazy for continuing to run every day even when there is little joy in it. I know that if I keep doing it now, when I finish chemo and get all of the toxic chemicals out of my body, I will come back strong because I will not be starting from scratch. I still have a base. I cannot wait to make the transition from feeling weak, slow, and generally unwell to feeling strong and falling in love with running all over again. Anyone can keep going when they feel good or are having a good time. What I hope will pay off for me over the long haul is that I have continued to stay active through many months where it was difficult. This does not mean I push myself hard every day. Some days I run slowly and some I run/walk. Perseverance matters. 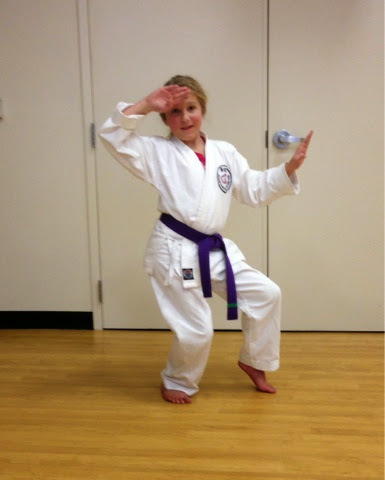 My younger daughter started karate lessons a while back. She enjoyed it at first, but then went through a period where she found it boring. The pace was not fast enough and learning the basics did not seem “fun”. She wanted to quit and we argued about it. Ultimately, she chose to stick through the time she found it boring, and she is now working towards her green belt. She loves going to class and sparring. She never would have discovered how much she loves to spar if she had not stuck it out through the period where she felt boredom. She tells me routinely how she is so glad she stayed with karate. Sticking with things when they are not fun or when they become boring teaches us that we have to work hard to reap rewards. Success in life will not come if we give up on something just because it is physically or mentally challenging. That is why even though I have slowed down considerably, I keep going. That is why, even though I have days where I break down in tears because running now feels so hard, I continue to get back out there day after day. Friday was a good day, and then Saturday was not. I had to walk almost the entire way I had planned to run. I was tired. The chemotherapy makes me much more sensitive to heat. I was suffering in the sun. I was frustrated. I wanted to cry. Instead, I walked when I had to and ran when I could. In a few minutes, I will be out there trying again. Tomorrow I start my sixth and final cycle of three chemotherapy treatments. I am not sure how long it will be until I feel like myself, but I will keep going until I get there.